An expert, unbiased guide to buying a prefabricated shower or planning a new, custom shower for your bathroom. 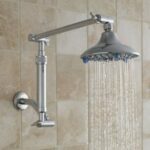 If you are remodeling or building a new bathroom, the chances are good that you’re considering a new shower. But a shower isn’t the kind of thing you shop for everyday…in fact, this may be the only one you ever buy. So the chances are pretty good that you may need a little help in sorting out the possibilities. This guide will help. In an ideal world, you’d probably like your new shower to be an enclosure that’s separate from the bathtub. That’s a good start, and the subject of this guide. 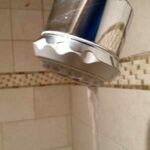 A shower can be just about anything that sprays to get you clean, from a primitive overhead bucket to a multiple-head enclosure that’s more like a high-end car wash. Here we look at the typical types. 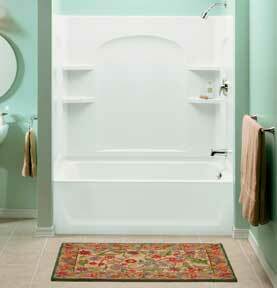 For information on bathtubs that double as showers, please check out Bathtubs. If you’re interested in a steam shower, go to Steam Showers. 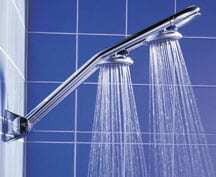 Showers differ by construction, material, size, and configuration. Your main decision will be to choose between a prefabricated shower that’s installed as a unit, or a custom showers that’s built in place and surfaced with tile or virtually any waterproof material. If you’re building a new home and have a generous budget, a world of options is open to you—and a custom shower may be just the ticket. If, on the other hand, you’re doing a minor remodel and are working on a tight budget, a prefabricated model will probably make more sense. Single-piece molded fiberglass, synthetic marble, or laminate showers are relatively inexpensive, quick and simple to install, easy to clean, and watertight. Prefabricated Shower Unit. Copyright Kohler Co. Most prefabricated shower stalls are formed with benches, integral shelves, and grab bars. Shapes include square, rectangular, and corner configurations. One-piece showers are common in new construction because they are very quick to install and don’t have seams that could leak in the future. Unfortunately, these generally don’t work in a remodel unless one or more walls are being removed because they are too large to fit through a doorway. 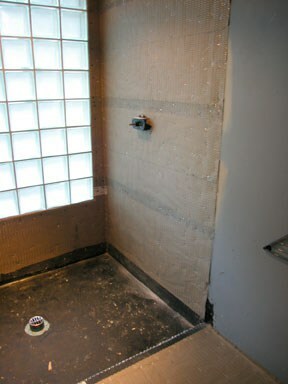 For most remodels, prefabricated showers with wall panels that are assembled on site work better. With these, wall panels fit over a molded shower base and are attached to a waterproofed wall. 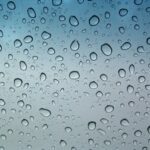 With the exception of one-piece showers, all showers begin with a base, sometimes called a receptor, or a “pan,” which can be purchased ready-made or built from scratch. Construction demands skill because the pan must be waterproofed and sloped precisely to the drain, which must be set at the right height for perfect drainage. Prefabricated bases—in molded plastic, cast polymer, solid-surface composite, or poured masonry—come in various sizes and shapes and can be used with wall panels or custom surrounds. If you’re remodeling, be sure to select a prefabricated shower pan that has a drain opening that matches the existing location of your drainpipe. A custom shower is built on the spot to whatever specifications you want. It can be a small tile enclosure built into an unusual corner, a conventional tiled shower, or something that’s really unusual, such as a stoned-lined area that’s open to the master bedroom. 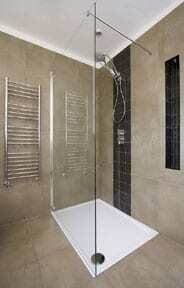 Basically, a custom shower needs a shower fixture, a drain, and surfaces that can handle the very wet conditions. In most cases, it also includes a curtain or a door. The typical custom shower starts with a shower pan that serves as a waterproof base with an integral connection to the drain. This can be purchased as a pre-made polymer, poured-masonry, or composite unit to save time and expense, or it can be can be built in place. The latter should be done by a professional tile contractor or waterproofing contractor. This job requires constructing a completely waterproof, sloped membrane to protect the subfloor from water and serve as a base for tile or the like. It may be made of plywood and multiple layers like hot-mop built-up roofing, or it may consist of a soldered copper pan, built up with a cement mixture and sloped to drain. A shower’s adjoining walls must be waterproof, too. They typically consist of wall studs covered by 15-pound builder’s felt, panels of cement backerboard screwed to the studs, and a final layer of ceramic tile, slate, granite, marble, or solid surface. Showers can be equipped with such luxuries as seats, multiple spa showerheads that can give full-body massages, or steam-shower generators. Those that serve as steam showers must be specially designed to contain the steam (see Steam Showers). Though building codes may allow a shower size as small as 32 inches square, allow at least 36 inches in each direction for comfortable movement in the enclosure.